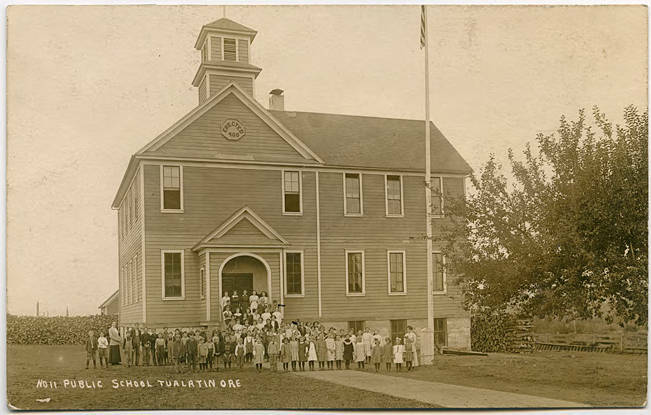 Postcard of the public school in Tualatin, circa 1900. 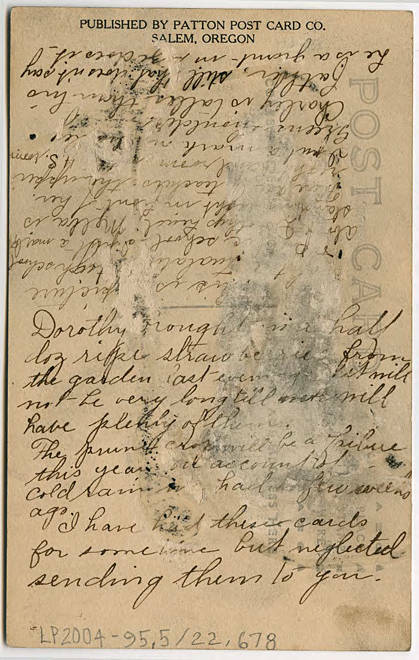 On the back of the postcard is a letter from Jesse Bryon, which also identifies her children Dorothy, Melba, and Charley in the picture on the front of the postcard. [front] No 11 Public School Tualatin Ore [back] Dorothy brought in half doz ripe strawberries from the garden last evening. [It?] will not be very long till we will have plenty of them. The prune [?] crop will be a failure this year on account of cold rain we had a few weeks ago. I have had these cards for some time but neglected sending them to you. [upside down] This is a picture of the Tualatin High school + public school. I put a mark about Dorothys [sic] head. Melba is standing right in front of her. There are [illegible] teachers. the upper right [illegible] room [illegible] H. S. room. I put a mark on [?] Greens shouldn't [?]. Charley is taller than his father, still that doesn't say he is a giant in size does it.